The AIR Camp Italy was a great success. Enrique Duvos, Adobe Platform Evanglesist, made a wonderful job showing a lot of cool AIR examples and explaining the possibilities that AIR opens. My speech was about the way you can create, export and deploy AIR Application using Dremaweaver CS 3 AIR exentsion, Flex Builder and Flash CS3. I talked on the importance of the analysis and desing of a Rich Internet Application in Flex, AJAX or Flash. I showed some tecniques and some architecture to implement for the development of application in order to produce a clear, stable and more reusable ActionScript 3 code (ModelGlue, CairnGorm, some J2EE design patterns). Then Matteo Ronchi and Fabio Bernardi took te entire afternoon for a real AIR development course. All is ready for the AIR Camp of 30th October in Milan oraganized by FlexGala. Adobe's Italy will host the event and we'll have Enrique Duvos, Adobe Evangelist, that will introduce AIR technology and will show us many cool applications developed for AIR so far. I'll show some tecniques to create Mashup applications with AIR connecting to Google Maps, Yahoo Maps, Ebay services, Wheater Channel and YouTube. This is the agenda of the event. The AIR Camp is free but it needs you to register ! The fourth email I received on how to package an AIR project with Flex Builder Beta 2, convinced me to write this post. Something changed in Flex Builder Beta 2 to create an AIR Project and to deploy an air package respect to the previous Flex Builder Beta. In order to create an AIR Project in Flex Builder, you go under File > New > Flex Project. A New Flex Project dialog window opens and thi is where you can choose the type of the Flex Project to create : for the web (under the Flash Player) and for the desktop (under the AIR Runtime). Select Desktop Application as the application type. Now that you have a project to export creating an .air package you can select Project > Export Release Version. In this dialog window you can choose to add multiple projects and applications, and sign an AIR File with a Digital Certificate option. Signing the AIR application is important to give a trust level to your project. You can use an existing digital certificate bought by a 3rd party vendors or you can create a new self-signed digital certificate. Clicking on Finish Flex Builder will generate the AIR package. 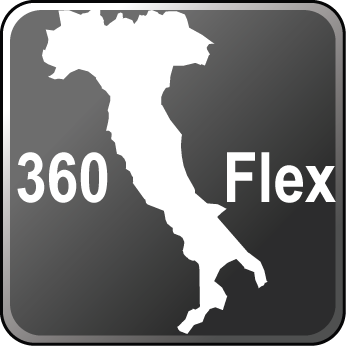 Yesterday we had the monthly FlexGala meeting and we had the opportunity to involve the Italian Java User Group. 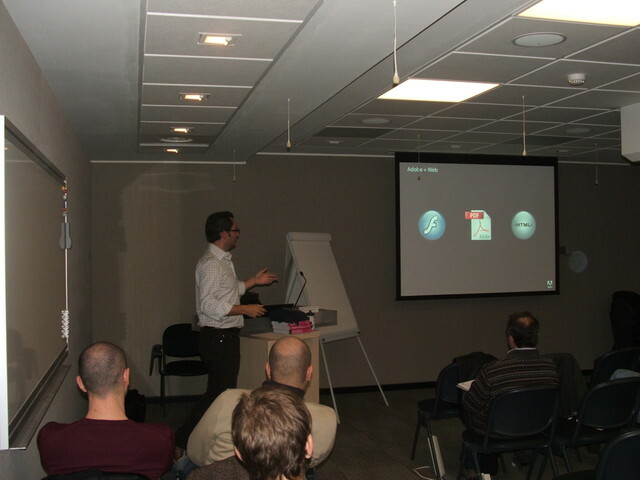 About 30 high-skilled Java developers to which I presented Flex 3, AIR and LiveCycle DS (very fast). Only 3 or 4 of them knew or had previously heard talking about Flex and AIR and all the audiance were very impressed about the stuff I showed. At the end of the presentation (where I did not talk deeply about LiveCycle DS since I had only 2 hours) we had a great Q&A session where they made very smart questions and doubts. - Differences between Flex and OpenLazlo. - How is it possibile to integrate Struts with Flex RPC calls ? - How a Flex application can be architectured ? - Accessibility in Flex. Does it follow the Italian Accessibility law ? under different AIR version (like Java Swing developers make for Java desktop applications that run on a specific JRE) ? - Do I have the possibility to restore an older version of my AIR application if the update process fails on the client machine ? - Security in AIR application. How does it work ? IS it different from JRE ? - Does AIR allow developers to access to the system devices to communicate for example with the COM ports ? My overall impressions about the meeting and about the Java community were awesome ! I love sharing thoughts with developers that use different technologies and have different mindsets. And they were very interactive and open minded. Our next meeting will be on 30th October. We organized the AIR CAMP event !